English clergyman John Michell suggested in 1784 that some stars might be so big that light could never escape from them. A few years later, French mathematician Pierre Simon de Laplace reached the same conclusion. 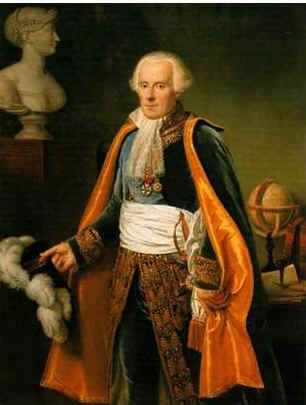 Michell and Laplace both based their work on the ideas about gravity put forth by Isaac Newton in 1687. Newton had said that objects on Earth fall to the ground as a result of an attraction called gravity. The more massive (heavier) an object is, the greater its pull of gravity. Thus, an apple would fall to Earth. His theory of gravity ruled unchallenged until 1915 when Einstein’s general theory of relativity appeared. Instead of regarding gravity as a force, Einstein looked at it as a distortion of space itself. Shortly after the announcement of Einstein’s theory, German physicist Karl Schwarzschild discovered that the relativity equations led to the predicted existence of a dense object into which other objects could fall, but out of which no objects could ever come. American physicist John Archibald Wheeler first coined the term "black hole" in 1967. Before the adoption of the term by Wheeler, the objects now known as black holes were referred to as frozen stars, dark stars, or collapsed stars. Black holes come in all sizes. Stellar black holes are the result of massive stars dying. Supermassive black holes are believed to have been created during the early Universe. The exact mechanism by which they were created is under debate. Some scientists believe in the existence of mini-black holes that were created at the same time as the Universe. This type of black hole, they maintain, is the approximate size of an atom yet has the mass of a large mountain. No matter what the size of a black hole, they all share a common characteristic; not even light can escape their gravitational pull. Though black holes have probably been around since the Universe began, only recently have we begun to learn in-depth information about them. In the last few decades astronomers began to look at the Universe in the radio, infrared, ultraviolet, X-ray, and gamma-ray regions of the electromagnetic spectrum and have been able to gather much more black hole data. Black holes can be said to “come in all sizes”, meaning that they have a wide range of masses. We are perhaps most familiar with “stellar-size black holes”; these are the black holes which form from the death of a very massive single star. They tend to have masses in the range of a few to a few tens of solar masses. Next, there are “medium-size” black holes, with masses in the range of a few hundred to a few thousand solar masses. These black holes are probably the result of the mergers and long-term evolution of stellar-mass black holes. Finally, there are what are called the “supermassive black holes”; these objects have the mass of a few million to hundreds of billions of solar masses. They exist in the centers of galaxies. Black Holes move through the Cosmos and destroy everything in their paths . But contrary to popular myth, a black hole is not a cosmic vacuum cleaner. If our Sun was suddenly replaced with a black hole of the same mass, the earth's orbit around the Sun would be unchanged. (Of course the Earth's temperature would change, and there would be no solar wind or solar magnetic storms affecting us.) To be "sucked" into a black hole, one has to cross inside the Schwarzschild radius. At this radius, the escape speed is equal to the speed of light, and once light passes through, even it cannot escape. Where M is the mass of the black hole, G is the universal gravitational constant, and c is the speed of light. The "radius" is essentially the distance from the center of the black hole, singularity, to the edge of the black hole, the event horizon. Event Horizon is the area surrounding a black hole where the escape velocity is equal to the speed of light. 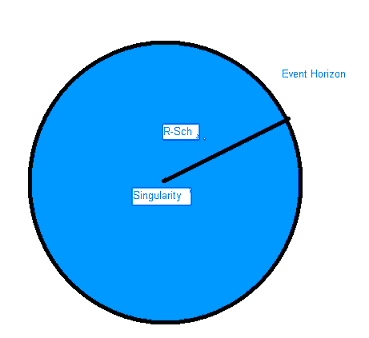 Singularity is a located at the direct center of a black hole. It is also a place of infinite space time curvature. This point exists due to the star's entire density being crushed to a single point having, then infinite density. Escape Velocity: The escape velocity is the speed at which one must travel to escape the gravitational pull of a given field. With black holes, the escape velocity is always greater than the speed of light. Because nothing can travel faster than the speed of light, and no signals can leave the black hole, the only indication of its presence is gravity 3. Though nothing can escape a black hole, we can calculate the rate that it would need to have. A black hole must have at least 3 stellar masses, otherwise it could not form on its own. How a Black Hole can be detected: Since no light escapes from them, black holes obviously cannot be seen. However, they do emit X-rays because all matter that is being pulled into them by their gravitational forces will be charged by heating and compression, which causes the emission of X-rays. Mini Black holes: These are black holes that did not have the mass to form on their own power, but Steven Hawking theorized that these types of black holes may exist by virtue of the fact that when the universe was formed, gravitational forces and pressures may have forced a mass to collapse on itself, thus forming a black hole that is smaller than normal. Super Massive Black Holes: These are black holes that have masses a few million times that of the sun or more and are speculated to be the power behind the nuclear activities that form galaxies. 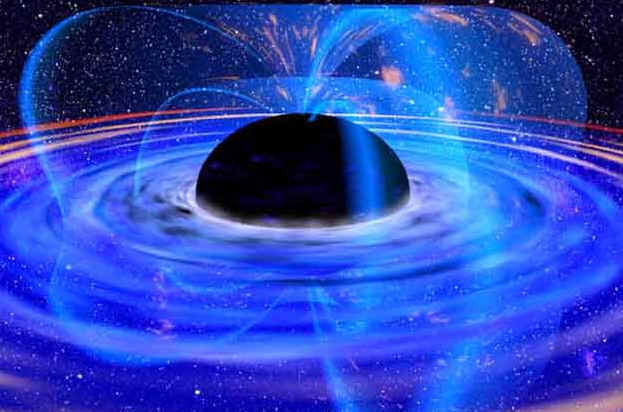 White Holes: This is another theory that hasn't been proven, but can be correctly solved by the Schwarzschild equation: A black hole might actually emit light or particles from its event horizon, perhaps into another universe. Wormholes: This is the linkage of a white hole and a black hole, such that what falls into a black hole would be emitted by a white hole, thus allowing "travel" between the two. Stephen Hawking has postulated a theory that states that Black Holes actually evaporate over time. This is because energy is used from the radiation and mass is slowly decreased. As mass decreases however, the radiation emitted increases, and the hole eventually vanishes. No one is really sure what happens after that. Some scientists believe that a small bit of the hole remains as a stable remnant. According to theory, there might be three types of black holes: stellar, supermassive, and miniature black holes – depending on their mass. These black holes would have formed in different ways. Stellar black holes form when a massive star collapses. Supermassive black holes, which can have a mass equivalent to billions of suns, likely exist in the centers of most galaxies, including our own galaxy, the Milky Way. We don't know exactly how supermassive black holes form, but it's likely that they're a byproduct of galaxy formation. Because of their location in the centers of galaxies, close to many tightly packed stars and gas clouds, supermassive black holes continue to grow on a steady diet of matter. No one has ever discovered a miniature black hole, which would have a mass much smaller than that of our Sun. Astronomers suspect that most black holes are produced when massive stars (at least 8-10 times the Sun's mass) reach the end of their lifecycle. Inside a star, gravity tries to pull matter closer together. While a star is glowing, it is consuming its fuel through a nuclear process known as fusion. It radiates not only light, but heat as well. The pressure of the heated gases pushing outward balances the force of gravity pulling inward. Once the star's nuclear fuel has been depleted, the star becomes unstable and the core implodes causing the outer shell to explode in a supernova. If the remnant core that remains after the supernova is less than 3 solar masses, gravity compresses the electrons and protons so that neutrons form. The pressure of neutrons in contact with each other counteracts the forces of gravity. This stable core, which is now composed almost entirely of neutrons, forms a neutron star. Neutron stars possess tremendous mass and consequently have a very powerful gravitational pull. If the remnant left after the supernova is greater than 3 times the Sun's mass, not even the neutron pressure can counteract gravity and the remaining material will continue to contract. The remnant collapses to the point of essentially zero volume (yet it has infinite density!). This creates a mathematical singularity. A singularity resides in the center of all black holes. A spherical region known as the event horizon marks what scientists call the "boundary" of a black hole. It is given this name because information about events which occur inside this region can never reach us. The distance from the singularity to the event horizon is known as the Schwarzschild radius, after the German physicist who predicted the existence of a "magic sphere" around a very dense object. Inside the region, he theorized, gravity would be so powerful that nothing could escape from it, i.e., the gravitational pull would be so strong that the velocity necessary to escape the pull is unobtainable. A black hole has such an enormous concentration of mass in such a small volume that in order to escape from it, an object would have to be moving at a speed greater than the speed of light. At this time we know of nothing that can attain the necessary velocity. Remember that a stellar black hole was once a star. Most stars have a companion star to which they are bound in a binary system. This nearby companion can be a source of material on which the black hole "feeds". 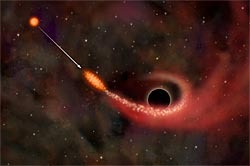 Matter can be pulled off the companion in large swirling streams of hot gas that spiral toward the black hole as a fast moving incandescent whirlpool known as an accretion disk. As the matter in the disk falls closer to the black hole, it heats up and gives off radiation such as X-rays. By measuring the motion and radiation from an accretion disk, astronomers are able to infer the presence and mass of the black hole. When all of the material in the accretion disk has been consumed, the disk disappears and the black hole is virtually undetectable. Stars and planets at a safe distance from the black hole's event horizon will not be pulled in toward the black hole. They will instead orbit the black hole just as the planets orbit the Sun in our solar system. The gravitational force on stars and planets orbiting a black hole is the same as when the black hole was a normal star. Supermassive black holes have masses comparable to those of a typical galaxy. These masses range anywhere from 10 billion to 100 billion of our Suns. Supermassive black holes tend to be in the centers of galaxies, creating what are called Active Galactic Nuclei (AGNs). An AGN emits more energy than would be expected from a typical galactic nucleus. The answer as to why this is so lies in the presence of the supermassive black hole in the galactic center. In some AGN, the massive black hole and its accretion disk somehow produce outward-moving streams of particles that are projected away perpendicular to the disk. These streams are known as jets and have the power to accelerate electrons almost to the speed of light. This produces gamma-rays that can be detected by gamma-ray observatories. 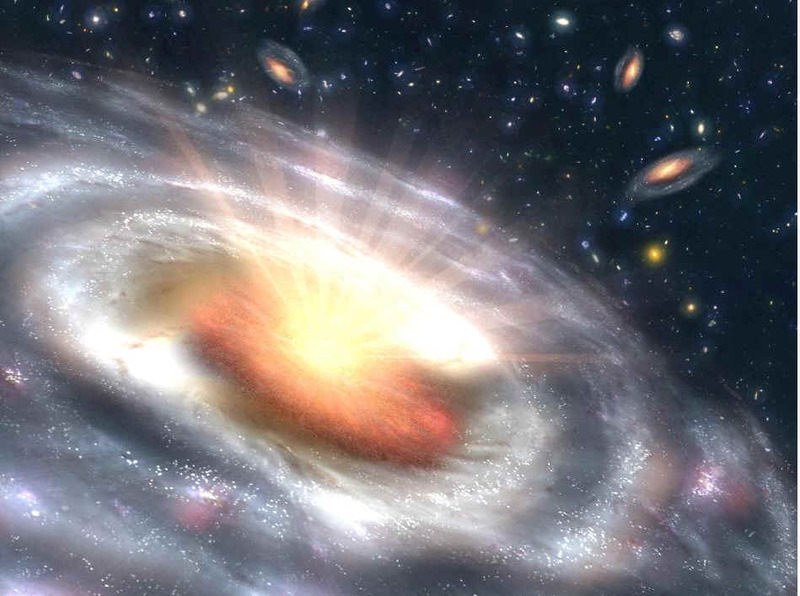 The most powerful AGNs in our Universe are called quasars. We have been able to detect quasars that reside 15 billion light-years away. Scientists believe that the study of quasars will provide information about the Universe during the time of early galaxy formation.